Daniel Scott Lasky and his wife Sharon loved the sea. They’d leave their home in Hickory, North Carolina, and head on down to Florida when they could to soak up the sun and take in some waves. When Daniel died after a long battle with Lou Gehrig’s disease (or ALS), he knew what he wanted to happen to him after he passed on. 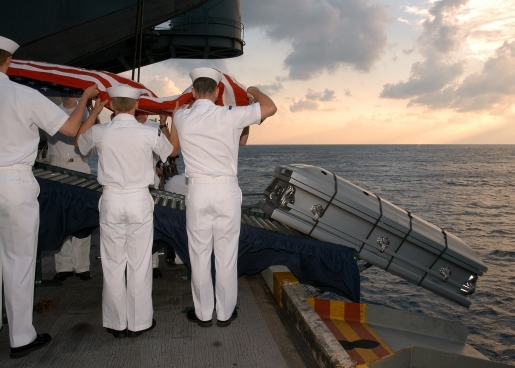 Daniel wanted to be buried at sea rather than in the ground or cremated into ashes. So his wife and family chartered a boat, the Mary B. III, took it out to sea, and buried Daniel in the ocean. Imagine their surprise when Daniel Scott Lasky’s body returned to shore 4.5 miles from where he was buried. One morning, he’s buried, his family goes fishing in his honor, and everyone returns home. The next morning, Daniel’s body comes floating up and ends up being recovered offshore at Port Everglades, Florida, after a panicking fisherman phones the police. Broward County Sheriffs and the Coast Guard are investigating whether or not any burial laws were violated. As for Lasky’s body, I hope they returned it to the sea (or that they will do so after their investigation is complete). The guy deserves the burial he wanted, even if he didn’t stay there the first time.